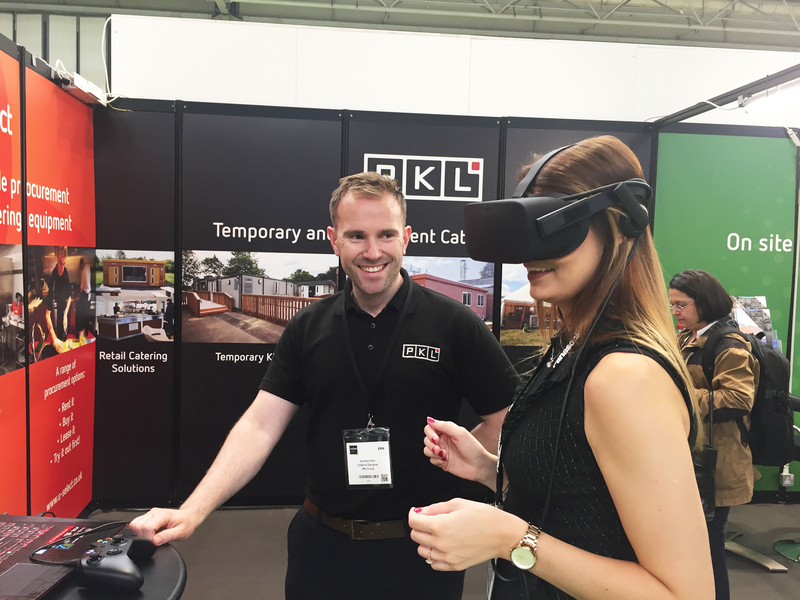 PKL, the UK’s leading temporary and modular kitchen infrastructure company will be invigorating it’s stand at this year’s Hotelympia with a futuristic VR experience. The company has prepared a series of fully interactive VR experiences for visitors to participate in. Visitors will be able to walk around virtual renderings of the company’s temporary, modular and event kitchens. The development team at PKL has been hard at work hard to create a range of interactive experiences for the show, that will allow users to experience a range of different kitchens available for hire from the company. The presentations will allow users to see just what it’s like inside a modular kitchen facility and to walk themselves around to get a feeling for what it would be like to be cooking inside a PKL kitchen. The PKL team believe that this customer experience is an exciting addition to the company’s service package and are looking forward to seeing visitors try it out on the stand at the event in the ExCel in London from March 5-8 this year. PKL’s VR experience is just one new exciting development at the exhibition, which is changing its format this year. It has four brand new shows, providing a platform for restaurants, hotels, pubs, casual dining and contract caterers to meet, review and source from the finest suppliers available in the market. Visitors will be able to don a futuristic VR helmet at the company’s stand, but will also be able to talk to the PKL team about the company’s new Podules retail catering solution, the newly improved Food Cube concession, find out about PKL’s brand new temporary kitchen buildings and U-Select’s rapidly growing catering equipment rental service. PKL’s Chief Executive Lee Vines said: “We are really looking forward to sharing our newly improved VR experience at Hotelympia this year. It’s a show we love to attend because everyone from across the hospitality and catering infrastructure world is there. We’re also very excited to be able to give out information on our new Podules retail catering product, which we think will change the way catering concessions are installed across the country, and our new, improved kitchen units too! PKL will be showing off their new products, websites and allowing visitors to experience VR on Stand 1748. PKL Group is the UK’s leading supplier of modular commercial kitchens, serving a wide range of both public and private sector markets. With hundreds of temporary kitchens and 10,000 items of catering equipment available to hire, the company supports clients during refurbishments, emergencies and events. PKL also offers a number of permanent modular kitchen solutions including high-spec commercial kitchen buildings which are delivered to site as pre-built modules, ready for quick installation. The company’s KitchenPod and Food Cube products have won various industry awards for innovation and have proven popular particularly in the education and leisure sectors. In addition, PKL offers catering estate management solutions, as well as specialising in major event kitchen complexes such as those used to feed athletes at events such as the Olympic Games. The company’s international division also delivers a wide range of specialist kitchen solutions to sites all over the world, from African mining camps to Antarctic research stations. Established in 1988, PKL’s head office is located in Bishops Cleeve, Cheltenham. The company currently employs around 90 staff and has successfully completed over 10,000 temporary kitchen hires worldwide, as well as over 200 permanent kitchen installations. If you have any queries about this press release, or about PKL and its projects, please contact PR and Marketing Exec Phil Scoble on 01242 663125 or email pscoble@pkl.co.uk. This press release was distributed by ResponseSource Press Release Wire on behalf of PKL Ltd in the following categories: Food & Drink, Business & Finance, Media & Marketing, Public Sector, Third Sector & Legal, for more information visit https://pressreleasewire.responsesource.com/about.